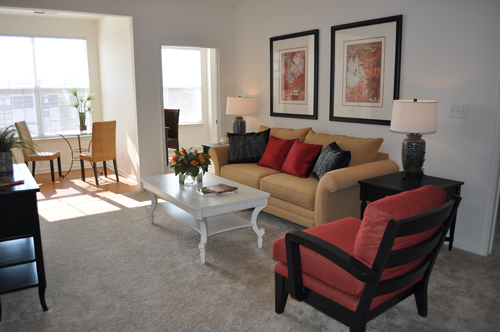 Check out these tips for effectively rearranging your apartment furniture! After living in your apartment for a while, you may feel like you want to change things up and refresh the space. While you may be able to paint a few walls, other renovations are not often allowed if you are renting your apartment. However, rearranging your apartment furniture is an easy way to make your home feel brand new, and you can do it without hiring an expert! Check out these tips for effectively rearranging your furniture in your apartment. Moving furniture around is much harder with clutter and items in the way. Before you start moving pieces, take some time to clean and organize your items. Keep out what you use regularly or on a daily basis, and move seasonal items to storage. This is also a good time to decide if you need to keep everything in your apartment, or if you want to discard or donate any unused items. Once you have a clean room and an idea of the design, start moving the biggest items, such as the sofa or bed. The large items are often the focal point of the room, so it’s best to know where they will be and design around them. Also, if you start with small items, you may realize that you didn’t leave enough space for your couch, cabinets, or bed. There are many ways to rearrange a room, so it’s important to know how you want the space to feel. For example, if you have a small room that you want to feel bigger, space out your pieces and keep the majority of furniture against the wall to increase floor space. If you have a large room that you want to feel cozy, place the pieces closer together. Also, remember to take your windows into consideration to get as much natural light in your apartment as you can. Don’t block the windows, and arrange the TV so the sun doesn’t create a glare on the screen. This entry was posted on Friday, July 27th, 2018	at 3:28 pm	. Both comments and pings are currently closed.